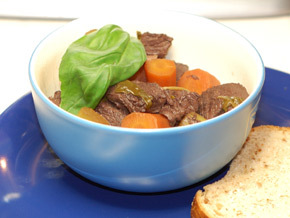 This warming stew is perfect for cold wintery days. Fabulous for warming cockles. 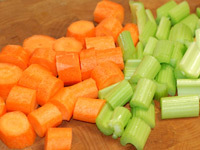 Peel the carrots and chop along with the celery into chunks about ¾ inch long. Remove the skin from the garlic and cut it into fine slices. 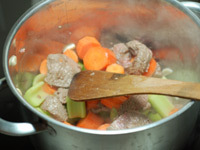 Chop the beef into chunks approximately the same size as the vegetables and remove any visible fat. Heat a tablespoon of sunflower oil on a high temperature then braise the outside of the beef for 30 seconds. Add the garlic, carrot and celery and cook for a further minute. Add the wine, vinegar, basil, salt and pepper and crumble or dissolve the stock cube into the pot. Turn the hob to the lowest possible heat and cover the pan. 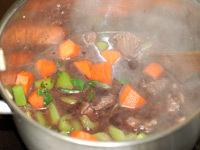 Leave the stew to cook for 1½-2 hours. Serve with pita or sourdough bread.